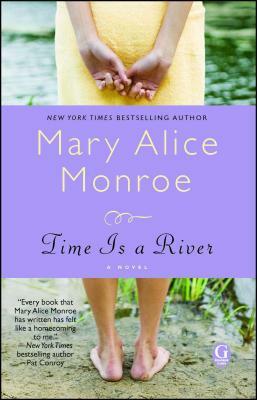 With a strong, warm voice that brings the South to life, New York Times bestselling author Mary Alice Monroe writes richly textured stories that intimately portray the complex and emotional relationships we share with families, friends, and the natural world. "Every book that Mary Alice Monroe has written has felt like a homecoming to me," writes Pat Conroy, bestselling author of The Prince of Tides. Time Is a River is an insightful novel that will sweep readers away to the seductive southern landscape, joining books by authors such as Anne Rivers Siddons and Sue Monk Kidd. Recovering from breast cancer and reeling from her husband's infidelity, Mia Landan flees her Charleston home to heal in the mountains near Asheville, North Carolina. She seeks refuge in a neglected fishing cabin belonging to her fly-fishing instructor, Belle Carson. Belle recently inherited the cabin, which once belonged to a grandmother she never knew -- the legendary fly fisher and journalist of the 1920s, Kate Watkins, whose life fell into ruins after she was accused of murdering her lover. Her fortune lost in the stock market crash and her reputation destroyed, Kate slipped into seclusion in the remote cabin. After her death the fishing cabin remained locked and abandoned for decades. Little does Belle know that by opening the cabin doors to Mia for a summer's sanctuary, she will open again the scandal that plagued Belle's family for generations. From her first step inside the dusty cabin, Mia is fascinated by the traces of Kate's mysterious story left behind in the eccentric furnishings of the cabin. And though Belle, ashamed of the tabloid scandal that tortured her mother, warns Mia not to stir the mud, Mia is compelled to find out more about Kate...especially when she discovers Kate's journal. The inspiring words of the remarkable woman echo across the years. Mia has been learning to fly-fish, and Kate's wise words comparing life to a river resonate deeply. She begins a quest to uncover the truth behind the lies. As she searches newspaper archives and listens to the colorful memories of the local small-town residents, the story of a proud, fiercely independent woman emerges. Mia feels a strange kinship with the woman who, like her, suffered fears, betrayal, the death of loved ones, and a fall from grace -- yet found strength, compassion and, ultimately, forgiveness in her isolation. A story timeless in its appeal emerges, with a power that reopens old wounds, but also brings a transforming healing for Mia, for Kate's descendants, and for all those in Mia's new community.